A watchmaker’s reputation for skilled workmanship is his most valuable asset. By paying too litle for cheap, imitation parts he can lose his reputation. Be sure you guard your reputation for good work by using parts that you know will be satisfactory. The manufacturers know they need to supply us with genuine parts. 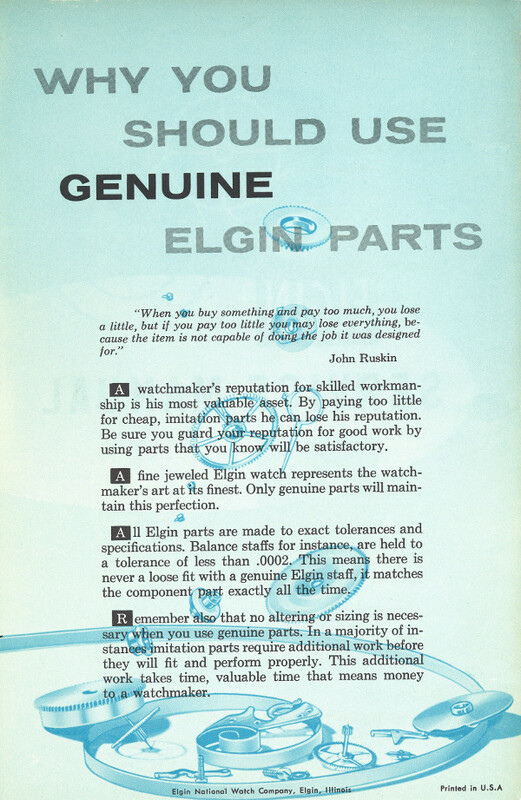 They have known it since 1965 when the Elgin watch company promoted their parts, and from before then, and they know it today. Watchmakers should use genuine parts and the manufacturers should sell them. Our reputation depends on it, and so does their’s. This entry was written by Jordan Ficklin and posted on December 18, 2013 at 1:07 pm and filed under watchmaking. Bookmark the permalink. Follow any comments here with the RSS feed for this post. Post a comment or leave a trackback: Trackback URL. Of course manufacturers say that. Follow the money. Best Fit said they were the best too. Newall didn’t go around telling watchmakers that their parts were junk. That advertisement is meant to generate income for Elgin, which by 65 was probably in some dire straits. I would find it interesting to compare some parts side by side. Perhaps some Rolex rotor axles and mainsprings against the aftermarket parts. Microscope shots and measurements. See if there is any difference in the bearing surfaces. See if the maisnprings are the same size. That would be some really useful info. I really like your blog, but advertisements are usually not reliable. Remember how Hamilton advertised the 500? It was supposed to be the greatest. I can say this, I have Best Fit Master Units, and quite a few old Elgin assortments. I don’t really see much of a difference. Of course, I might just be really lucky.